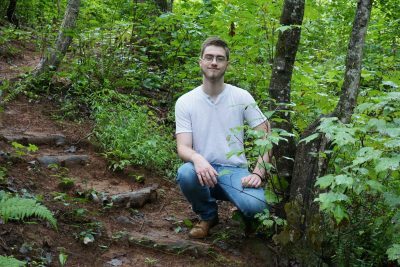 Before 18-year-old Logan Mossbarger began college at North Carolina State University in Raleigh in 2017, he created a legacy in his hometown of Franklin—a hiking trail at Mainspring’s 64-acre Gibson Bottoms property. Logan connected with Mainspring to complete his senior project, a requirement for twelfth-graders at Franklin High School. With the help of volunteer John Garrison, Logan created a plan to build a hiking trail—a project Mainspring had been interested in doing for some time. Logan’s plan included the design, layout, and construction of the trail. Logan and John were able to fully complete 700 feet of the 1.7-mile trail before his senior project ended in May 2017. In early July, 21 students from Haywood Community College’s Fish and Wildlife Management Technology program, under the guidance of instructor Shannon Rabby, contributed a half-day of service to the construction of the trail. The students cleared downed logs and ground vegetation and raked away leaves and soil duff on over 2,100 feet of trail.